New for November 2005! 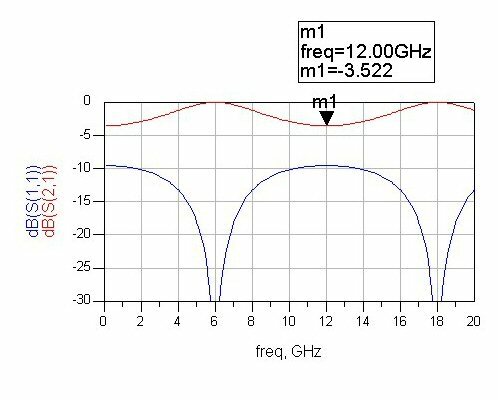 Parabolic equalizers are the answer to the question, "how am I going to flatten the gain of this wideband tube amplifier?" 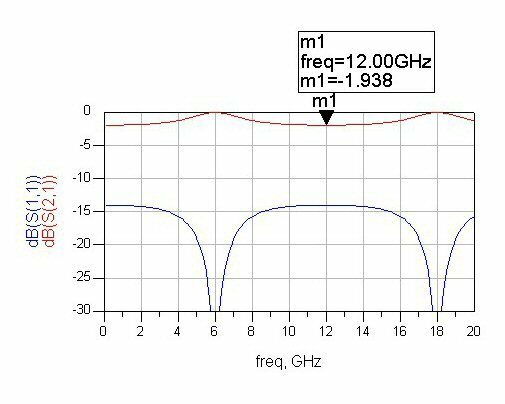 Wideband amps such as TWTs have maximum gain at the center frequency and fall off at the band edges, sometimes by 10 dB or more. The solution you need to create a solid-state driver that has the inverse gain characteristic (highest gain at band edges). The parabolic gain equalizer is buried inside the solid-state driver amp to give it the required frequency response. 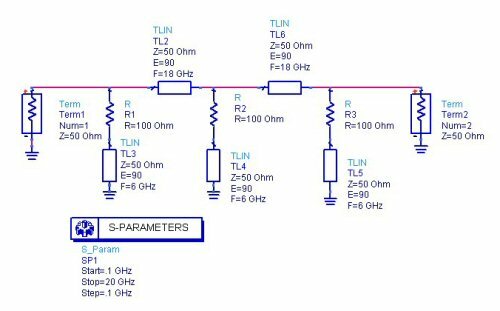 The schematic below was generated on Agilent ADS. The basic operation of the circuit is that special shunt lines load down a transmission line. 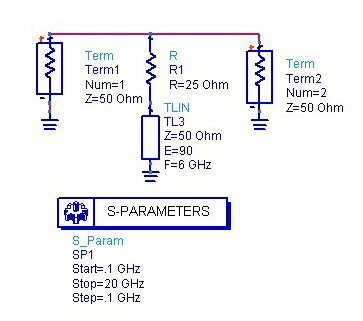 The shunt lines feature a short circuit stub which is a quarterwave at the lowest frequency. These present an open circuit at the lowest frequency (where zero attenuation is desired), and also at three times the lowest frequency, where they are three-quarter wavelength. In our case, they don't load the circuit at 6 GHz, and also at 18 GHz. At the top of each stub is a lumped resistor, typically higher than Z0. We used 100 ohms in the example. This has the effect of dropping the gain by about 2 dB at the center frequency, where the stub is a half-wavelength. To get more attenuation at the center frequency, you add more stubs, and separate them by a quarterwave at the highest frequency. This technique will provide a parabolic response, and remains reasonably impedance-matched in the band. 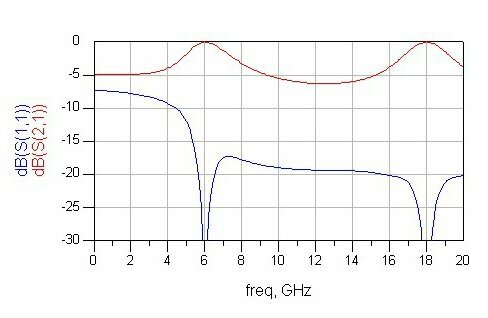 Our quick example has better than 17 dB return loss. Here are the responses of a single-stub equalizer. You will see that as the resistance is reduced, the line is loaded more (attenuation at the mid frequency increases), but the network's input match quickly degrades. The three plots below are for 100, 50 and 25 ohm loads. This is the reason that the load must be distributed along the line!